I'm trying to figure out what the best design format will be for an event selection tool. I've looked at how other companies are doing it like Facebook & Google and rental car companies etc. 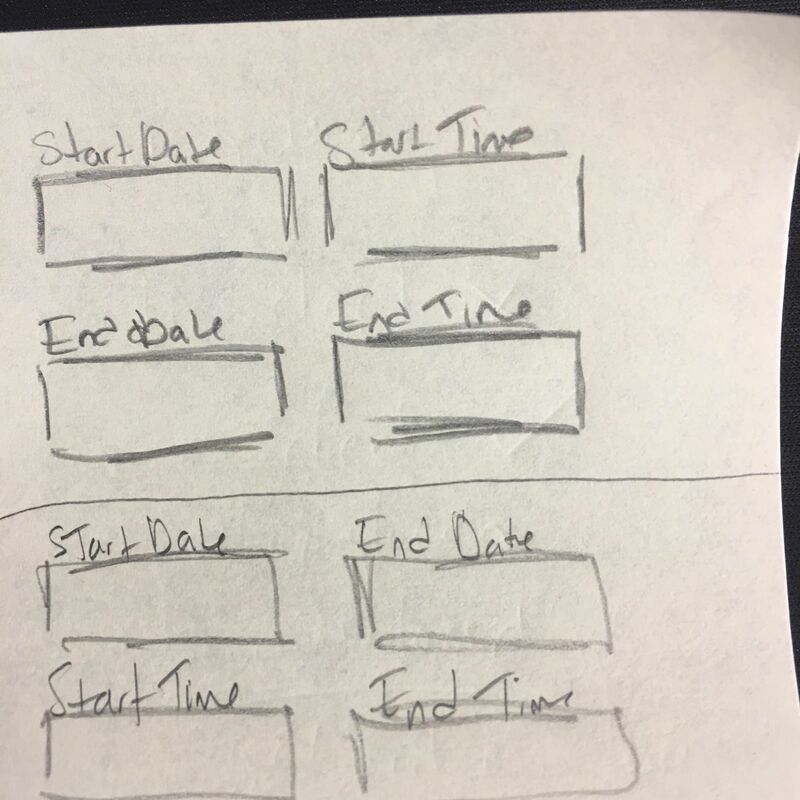 Maybe I just need to do some more research, one can never do enough of that but what are your thoughts on how to relate the start date to the start time and end date to end time such that it's not possible to confuse the start & end time with being the start and end time of each day of the event? I hope this makes sense. Maybe I'm approaching this all wrong, any input is VERY welcome. Thanks in advance. In my opinion, because our eyes normally read things from left to right (I suppose unless you're native right-to-left language speaker/reader), your top approach seems like the best bet to me. Your bottom solution seems as if it dissociated time and dates for start and end. I also would consolidate Start time + date and End time + date. Have a look at the screenshot below. Or something along those lines - styling of course is up to you and your team. Not the answer you're looking for? Browse other questions tagged usability user-research ux-field datetimepicker task-flow or ask your own question. What is the best way to design a date/time picker that requires an input for minutes and seconds? Where to start when I'm the solo product designer in the company?